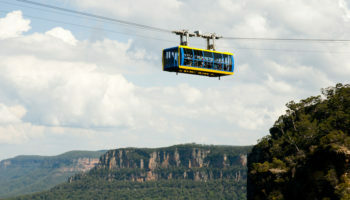 Australia is known for its thunderous natural beauty and clean cities. 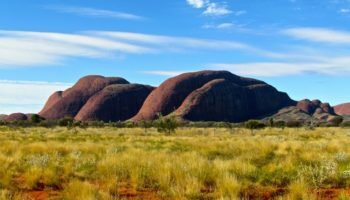 The red continent’s most amazing places to stay integrate seamlessly into their surroundings to give you the most authentic Australian experience possible. From lodges at the mouth of nationally protect gorges to hotels next to graffiti alleys, you’ll find a wide variety of possibilities in these stunning hotels. The Shangri-La Hotel may have a rather mundane exterior, but it’s the rooms, service, history, immediate area and the view that you pay for. Next to the old Customs House and the oldest section of Sydney, known as The Rocks, the Shangri-La Hotel towers over Sydney Harbour. Most rooms have a direct view of the iconic Sydney Opera House and the hotel is built right on the causeway leading to Sydney Harbour Bridge. So take a stroll over the bridge, grab a meal at the historic Australia Heritage Hotel just a stone’s throw away in The Rocks and then watch the sun set over the Opera House from your room. It doesn’t get more Sydney than that. 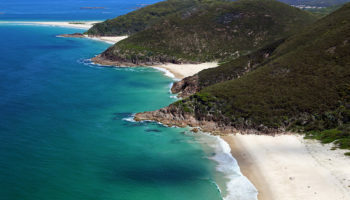 Travel to the midway point between Brisbane and Sydney then head east out into the ocean and you’ll find Lord Howe Island. 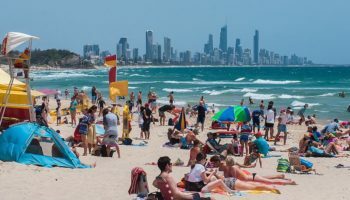 It’s sort of Australia’s version of Hawaii. Two large mountains tower out of the ocean and shelter an azure blue lagoon on the east side of the island where you’ll find the Capella Lodge. The world’s southern-most coral reef encircles the island to make for calm waves and great snorkeling. The lodge offers a variety of suites that integrate beautifully right into the natural surroundings of the island. You won’t want to stay indoors on this tropical paradise so the lodge offers outdoor dining experiences and spa treatments. Explore Australia’s funky big city on foot from the Grand Chancellor. You’re just steps away from Cocker Alley where local artists cover the buildings and street in some of the world’s best graffiti art. Stroll a little further towards the river to experience home of the Australian Open at Rod Lavar Arena. 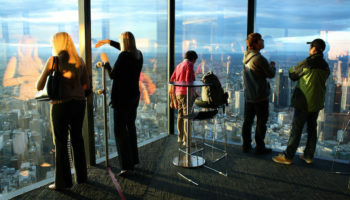 A few more minutes and over the river you’ll find Eureka Tower, the Southern Hemisphere’s tallest building. The rooms at the Grand Chancellor are masculine and comfortable. But the highlight of the hotel has to be the heated rooftop pool where you can enjoy a swim and the view of Melbourne’s skyline at any time of year. This ultra-modern hotel is a destination unto itself. Curvy steel architecture makes up the main building while the hotel’s suites are built stepped into a hillside overlooking Cove Beach. Nearly a three-hour drive from Hobart, Tasmania’s only city, Saffire Freycinet is for escape. The amenities coupled with an outstanding view from every room makes the Saffire Freycinet perfect for total relaxation. The award-winning spa performs treatments overlooking the bay and you can dine on fresh oysters while knee-deep in an estuary. Don’t worry, the wait staff brings the white-cloth table out into the water for you. That’s the kind of service and experience you can expect at the Saffire Freycinet, Tasmania. Far North Queensland is ripe for exploration. 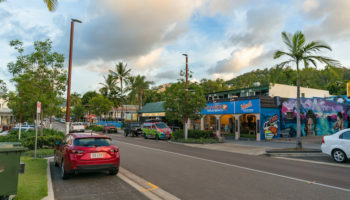 Travelers flock to Mossman Gorge as they drive up the coast from Cairns on their way to Daintree National Park. At the mouth of the gorge, you’ll find the understated luxury of the Silky Oaks Lodge. It’s the kind of hotel that you’d dream up as a child. The solid wood architecture blends into the surrounding forest so well that you’d swear the entire building is a tree house. The tranquil, crystal clear waters of Mossman River float by underneath the hotel. You can feel the ancient Aboriginal history flowing out of the gorge where you can take a Dreamtime Walkabout with an Aboriginal guide. Cool winds flow out of the gorge and envelop the Silky Oaks Lodge to protect against the tropical heat. 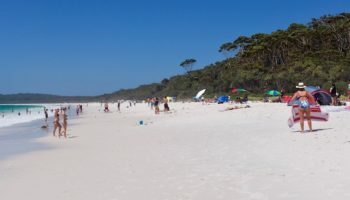 Many consider Whitehaven Beach in the Whitsunday Islands to be the most beautiful beach in the world. The Qualia Resort, on neighboring Hamilton Island, is the closest you’ll get to the uninhabited Cumberland Island’s iconic strip of white sand. This boutique resort is rather small but it feels incredibly spacious due to its architecture. The resort is made of entirely of local wood and many parts of the resort are open to the beauty of the outdoors to integrate nature into the resort experience. This exclusive retreat is for adventurers. Explore the Whitsundays and the southern tip of the Great Barrier Reef on daily boat expeditions. And you won’t believe the ocean shades of blue as you swim the Qualia Resort’s infinity pool that seems to pour into the sea. 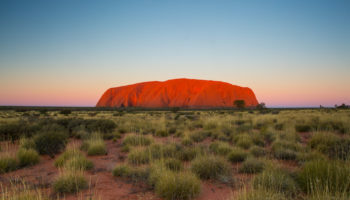 Latitude 131 is built to respect the Aboriginal holy site of Uluru, otherwise known as Ayers Rock. 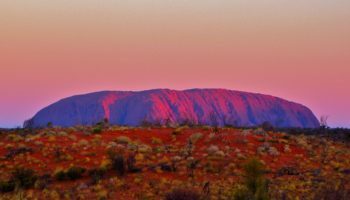 Uluru is a single rock that sits upon the earth independently. And it’s the size of a mountain. 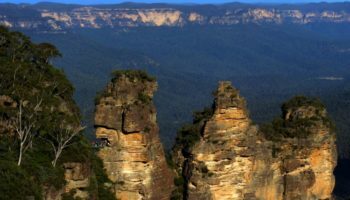 The holy site is deep inside the interior of Australia and you’ll only find committed travelers here. The lodge is a series of eco-friendly tents that are outfitted with luxury beddings, linens and air conditioning units. Dining takes place outdoors in the shadow of Ayers Rock. The entire experience connects you to the natural beauty of the surrounding desert. Park Hyatt one-ups the Shangri-La Hotel in location. Perched right at the edge of the south side of the Sydney Harbour Bridge, the Park Hyatt also has an unobstructed view of the iconic Syndey Opera House. But this view is from across the waters of the Circular Quay which gives you a more impressionable visual experience. The hotel is built into the hillside leading down to Circular Quay with its rooms being built like stairs on top of each other, so you won’t get the towering heights view of the Shangri-La. Offering standard Hyatt amenities such as a spa, high-quality restaurant and bar, the Park Hyatt is an indulgent Sydney landmark experience. The Southern Ocean Lodge is about as far away you can get from civilization in Southern Australia. Perched on the southern tip of Adelaide’s Kangaroo Island, the Southern Ocean Lodge is another eco-friendly accommodation. 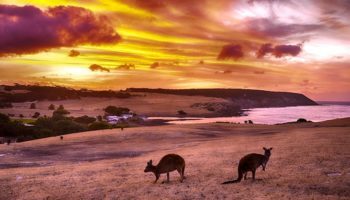 Kangaroo Island is known as the Galapagos of Australia. 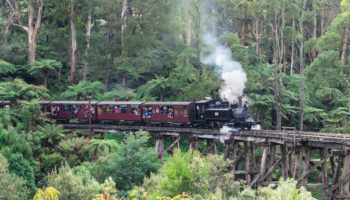 The island is covered in native animals such as the iconic Kangaroo. You might even have a close encounter. Every suite has an ocean view as the rooms are built longways into a cliffside. You’ll find the main hall at the hotel’s highest point where there’s an infinity hot tub overlooking the cold waters of the Great Southern Ocean. You can look out towards Antarctica, take in the sound of the most unexplored ocean in the world and utterly relax.